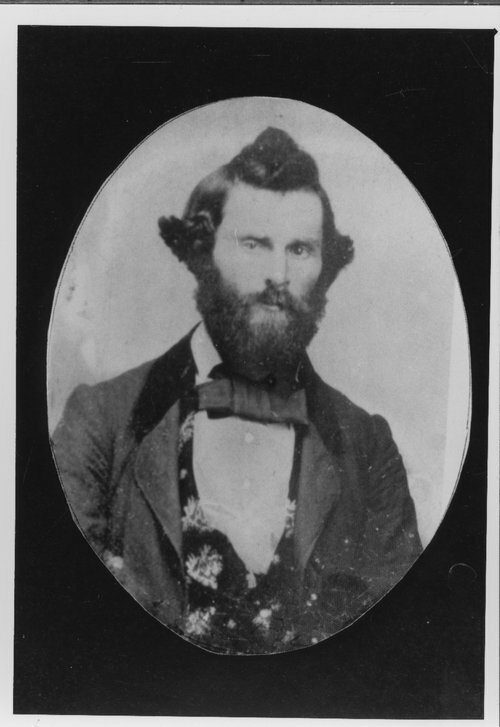 A photograph portrait of Elisha R. Mardin (or Marden), who ranched near the Cottonwood River in northeast Chase County, Kansas. He was born on August 27, 1833, in Chenango County, New York, and moved when he was twenty-one to Bloomington, Illinois, where he taught school and engaged in agriculture. It was at that time he met his future wife Elizabeth Frank. Elisha came to Kansas in 1859. He farmed, raised livestock, and bought cattle for Dolby Brothers, Drovers and Livestock, of Chicago. Late in the summer of 1861, he and Elizabeth were married and moved to his farm in Chase County, Kansas. In 1868, Elisha was elected county sheriff, and the Mardins' sold their farm and moved to Cottonwood Falls. Diaries kept by the Mardins' are at the State Archives and Library, Kansas State Historical Society.